The Manhattan Minstrel Eddy Davis playing a great selection from Duke Ellington and Billy Strayhorn's "Far East Suite". I use to love playing this with my old buddies in the band I had at "The Cajun" restaurant in Manhattan. Scott Robison - Conal Fowkes - Orange Kellin - Debbie Kennedy and guest at times "Mr. Spoons" Joe Jones. Davis is playing on his Custom OME 12" head - 17 fret Tenor Banjo. I keep pushing these more advanced musical compositions because I think they put the Banjo in a more musical setting, with a more advanced harmonic setting. I'm trying to show that the Banjo is a Musical Instrument that can do whatever any other Musical Instrument can do. It seems to be my lot in life to do this for such a wonderful Musical Instrument -- Please bare with me. 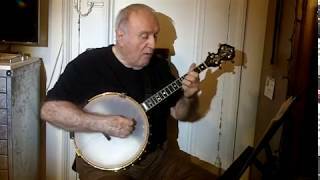 "The Manhattan Minstrel"
Sspeaking as a new and inexperienced and still naive banjo student all I can do is agree with your statement and thank you for sharing your talent and teaching. Thanks for putting the sheet up Eddy. I'll record it this week. I haven't picked the banjo up in a few days Eddy, but what other song/tunes do you find unique? Which ones catch you ear at this point in time? I know the more I listen to things, the more my ear changes. Things I didn't like before......become more apparent, and suddenly I really like the "dissonant" tones I'm hearing. Is there such a thing as dissonant?